Remove the Castello Extra Creamy Brie from the fridge, ideally an hour before serving. Scrape the seeds from the vanilla pod and mash with the sugar. Turn the berries and the vanilla sugar together and allow to draw on the kitchen worktop for at least 30 minutes. Melt the butter in a pan and, while beating, mix in the flour, icing sugar and egg whites. Place one tablespoon dollops of dough on a baking sheet lined with baking paper. Spread each dollop of dough out so it is approx. 10 cm long. Bake in the oven at 190°C in a conventional oven for approx. 8 minutes – or until the edges begin to turn golden brown. Allow the crisp tuiles to cool slightly on a rack. 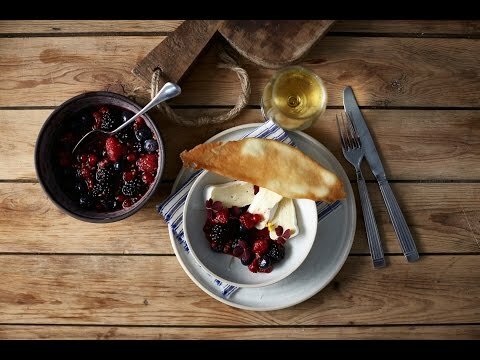 Cut the cheese and arrange on four plates together with the mixed berry compote and the tuiles. Garnish with fresh sorrel and serve with chilled Sauternes.